7.48 points at 23 votes (rank 216). 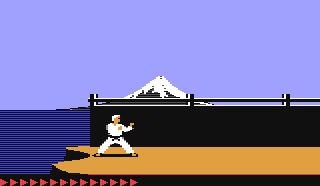 In 1984 the today well-known Jordan Mechner wrote the karate game Karateka, which became a success due to its realistic fighting animations and was therefore converted for numerous home computer systems and consoles. 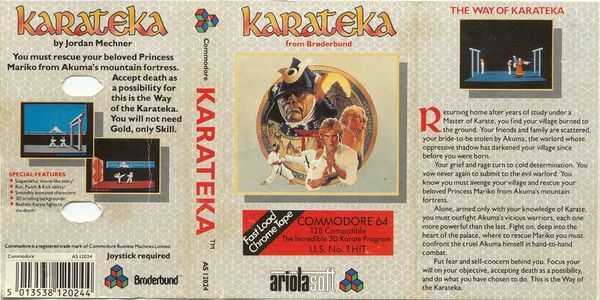 In 1985 the C64 version was published. 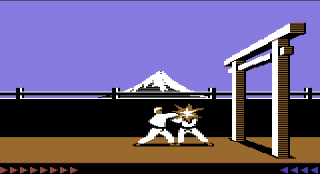 The game title Karateka stems from the Japanese language and describes a fighter (Japanese: Budōka) who carries out the Japanese martial art karate - so short karate fighter. 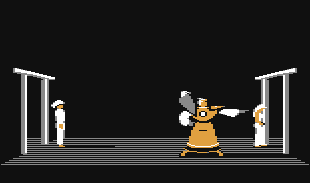 The game has a simple build-up: You walk from left to right and fight. When you do not play, a demo is shown. A small disadvantage is the permanant reloading of parts of the game. The course of the game can be explained in a simplified way as follows: After an introductory sequence and a start animation you get as lonely, well-trained Karateka onto the island which is ruled by the evil warlord Akuma to free the princess Mariko who is locked in the deep, dark dungeon of the palace. This is in such fighting games or action adventure of course combined with some perils and obstacles, especially a rather high number of differently trained karate fighters of the warlord Akuma stand in your way. Towards the end of the game you also face Akuma and his fighting eagle. Finally, when all enemies are defeated, there is a nicely animated final sequence and a final text. Seen this way, "Karateka" - as also the follower "Prince of Persia" - is an interactive story with a given plot. A well-practiced player can play the game to the end within 20 minutes. "You've just scaled a treacherous cliff to reach the fortress of Akuma, the evil warlord who burned your village and kidnapped your bride-to-be. Now you stand before a massive gate. The first of many powerful Palace Guards blocks your way. Beyond looms Akuma's Palace, where Princess Mariko languishes. Only you can save her from Akuma's cruel clutches. Remain calm, and focus your will on your goal. That is the way of the Karateka." Start screen at the cliff - now always keep walking to the right and fight! Simply kept but adequate looking Japanese background and palast graphics where the fights take place. The screen switches horizontally from left to right or correspondingly backwards. This is also the only moving direction through the game, from the beach to the dungeon - always walk to the right and fight. The fighting movements are a bit slow due to the realisticly animated fighting movements. The characters are a bit grainy. For a short rest between the fights, there are musically accompanied, animated intermediate sequences every now and then. During the fights you can only hear fighting noises and no permanent background music. Before and after the fights there is a short, suspenseful music seuqence. The Karateka has a certain number of power points. If the hero has lost all his (red) power points (lower left) the game is over. The power points regenerate automatically if you do not fight or are not attacked. Different doors have to be kicked in. Although there is no time limit in the game, the enemies need to be fought fast, as they also regenerate (blue power points at the lower right). The version by "Remember" offers next to the manuel also different cheat modes. H.T.W: "A sensational game at that time due to the very good animation of the fighters and the start, end and intermediate sequences. Unfortunately the whole things is played a bit sticky and there are not many surprises. To simply fight your way from left to right to the next enemey is not everyone's thing. Due to the atmospheric appearance and the film feeling, however, it stands out from mediocrity.". This page was last modified on 20 November 2017, at 04:00.